Reading about how hard it is to get replacement parts for Teslas, I thought I’d see what RockAuto has to offer, just out of curiosity. Wasn’t expecting much, but dang, I really wasn’t expecting to be able to fit so many vehicles in one screenshot. 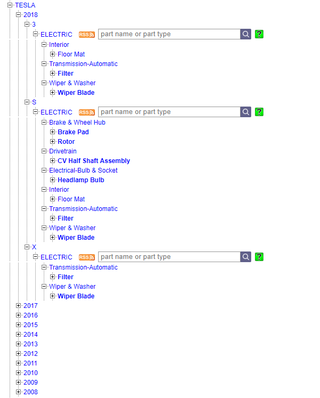 Before grabbing the above pic, I expanded the part categories for all 2018 model year Teslas. This includes parts for the Model 3, Model S, and Model X. Okay, well there were only about 2,450 Roadsters built, so let’s look at something with more substantial production numbers. How about a Model S? We’ve already looked at what’s available for 2018 models, so let’s see what’s available for 2012. If you want to see more, this link is primed to take you directly to the Tesla section of the RockAuto catalog. Knock yourself out.